Fate smiles on your sober-ride search. Ride results are provided by third party sites. Be Smarter Than That.Be Smarter Than That.Don't drink and drive. 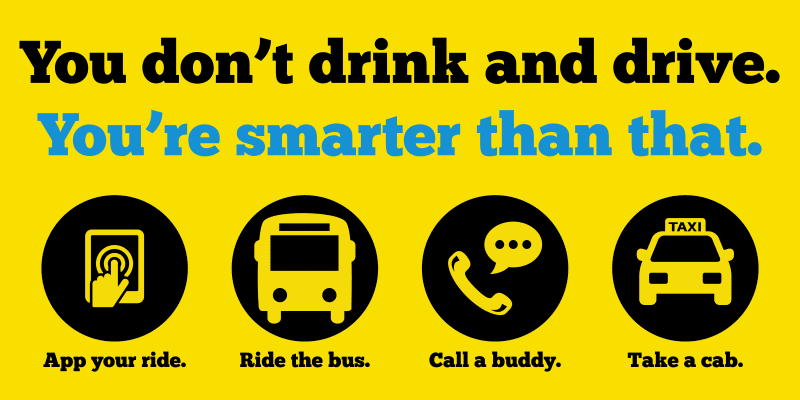 Ask a buddy to be a designated driver or call a sober friend to pick you up. Of all your friends, we bet you can find a sober driver (Facebook will ask permission to access your account). Find a sober ride in 140 characters or less. Going out soon, who wants to be my designated driver? Alcohol slows a driver's reaction time, reduces their ability to properly gauge speed or distance from other objects and makes it difficult for them to focus on the road. Sometimes, one or two drinks are all it takes to impair someone's ability to drive. Alcohol steadily decreases a person's ability to drive a motor vehicle. The more you drink, the greater the effect. North Carolina law makes it illegal for someone with a blood alcohol content â€“ or BAC â€“ of 0.08 percent or higher to drive a vehicle. Some people may reach this limit after only one or two drinks, depending on their body size and other factors. Driving â€œbuzzedâ€ with a BAC less than 0.08 can also be a form of impaired driving and dangerous. Drivers can be stopped and arrested by law enforcement when impaired -- regardless of BAC. Impaired drivers risk killing, disabling, disfiguring and injuring themselves and others. DON'T DRINK AND DRIVE. YOU'RE SMARTER THAN THAT. There are more ways than ever to get home after having a drink or two. Planning ahead for a sober ride is the best way to ensure you get home safely. Don't wait until after you have started drinking. If you have been drinking here are a few ways home: App your ride. Ride the bus. Call a buddy. Take a cab. That also applies to others you know. If you know someone who is about to drive impaired, take their keys and find them a sober ride home. More than 350 people in North Carolina are killed in alcohol-related crashes every year. Not cool. Drinking and driving can also land you in jail and lead to a consequences you can't even imagine. Alcohol and asphalt don't mix. If you're drinking, don't get behind the wheel and take a chance on being arrested or hurting yourself or someone else. Don't drink and drive. You're smarter than that! Attorney fees (between $500 and $1,500). Jury trial or appeal to a higher court boosts costs even more. Insurance premium increases up to 400 percent. Your driver license can be revoked for one year for the first offense, four years for the second and permanently for the third or more offenses. Pretrial driver license revocation fee of $100. Limited driving privilege fee of $100. Substance abuse assessment fee of $100. A minimum of $75 for substance abuse treatment and $160 for ADET school. If ordered to perform community service, pay a fee of $250. Drivers License restoration fee paid to DMV of $100. Drive while drugs you previously consumed remain in your system, unless the drugs were lawfully obtained (prescribed to you) and taken as prescribed. OVER 21 – In North Carolina the legal limit for intoxication is .08 BAC (blood or breath alcohol concentration). However, drivers can be stopped and cited when impaired regardless of BAC. North Carolina a BAC of 0.04% or more will land you in jail. In addition, if you are convicted and have an alcohol concentration level of 0.15 or higher: • All driving privileges suspended immediately for 45 days. • At the end of 45 days, the judge can issue a limited driving privilege, which will only allow you to drive to and from your place of employment, or where you are enrolled in school, to any court-ordered treatment or substance abuse education, and to any ignition interlock service facility. • For one year you are required to have an ignition-interlock system installed in your vehicle at your own expense. This device tests your breath for alcohol before allowing you to start your car and while you are driving. Many employers will not hire and may terminate a person due to a DWI conviction because of higher insurance costs. Schools and colleges may reject an applicant with a DWI conviction in favor of an applicant without a DWI conviction. The military may delay entry, reject, or separate a person due to a DWI conviction. Find a ride using one of these apps.